Patterns, Books and Progress, Oh My! I was super excited that I would never have to pay for a pattern or book! Well that lasted for a long while, but in the past year I’ve purchased a few patterns and more recently, a couple of books! I pre-ordered this modern quilt as you go book a few months ago and I can’t wait for it to be distributed next month. 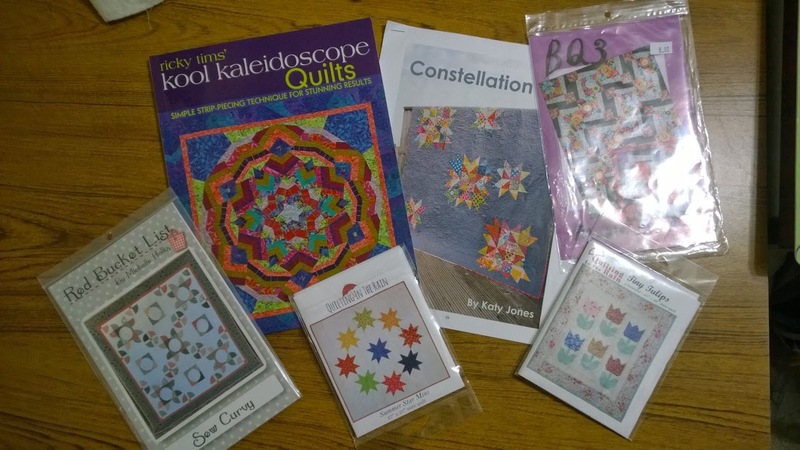 And even more recently, after falling in love w/ a beautiful kaleidoscope quilt seen on Fresh Off The Frame, I ordered Ricky Tims’ book, Kool Kaleidoscope Quilts. And speaking of books, I recently inherited a great deal of books from the AQG who closed their library earlier this year. Members were allowed to choose pretty much any books we wanted. Here are the ones I chose. In Quilty news, I did get the college-bound quilt basted last weekend and have even started quilting it. I’m using the techniques that Ann Petersen teaches in her Craftsy class: Quilting Big Projects on a Small Machine. Here’s what I have so far on the Summer Star Mini. In Yoga news, 2 weeks down, 10 more to go! Keep praying for me. Until next time, Happy Quilting and God Bless. Still Learning, a Quick Finish and Freebies! There are a couple of things from this week that I’m excited about. First, I learned how to tie a Quilters Knot! The gal who taught it to the kids at sew camp this week was surprised that I didn’t already know how; and honestly, I was a little embarrassed. But there was one other mature quilter who also didn’t know…so I didn’t feel so bad after all. 😉 This is something I could have learned from YouTube, but I wasn’t interested before that day because I’d been using a knotting technique I learned from +Quilting In The Rain‘s tutorial. Before this tutorial, my knots were also “ghetto”. 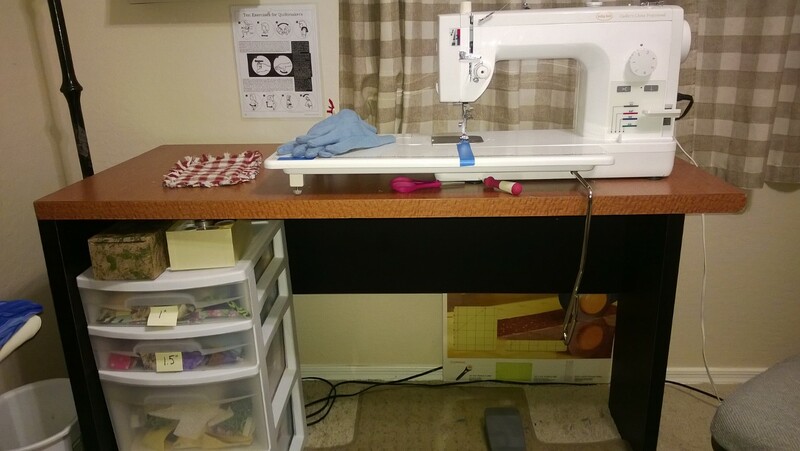 I’m thankful to have added another technique to my quilters resume. And the other thing I’m excited about is also something I discovered at sew camp: Chaco Liners by Clover! 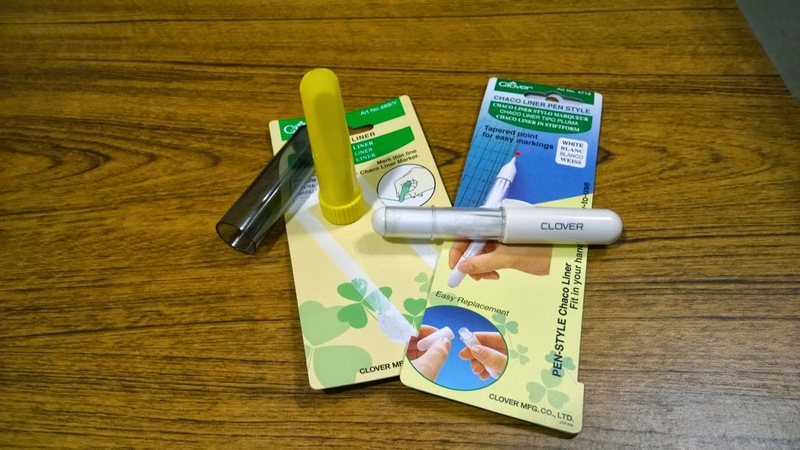 These chalk pens and liners work wonderfully for marking quilts w/straight or curvy lines, half square triangles and any other fabric markings. There is no mess and the chalk just washes or brushes away. They come in several colors and are refillable! I bought yellow and white. This is the 3rd year my quilt chapter, Quilters Anonymous, has held kids sew camp. It’s a week long day camp, Mon – Fri. There are 2 sessions, 9a – noon and 1p – 3p. Last year I volunteered for 1 afternoon. This year, I did 2 full days. Next year, I’m planning on doing the entire week. I really enjoyed it. The kids had the option of making 4 smaller projects or 1 lap quilt. 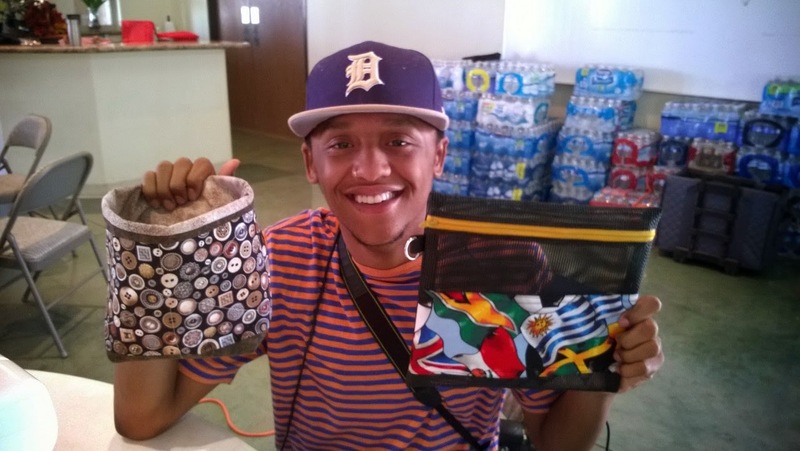 I brought my youngest son (19) to camp one day and he made a thread catcher/scrap bag and a zippered mesh bag. He was pleased w/his accomplishments and now has a greater appreciation for my craft. 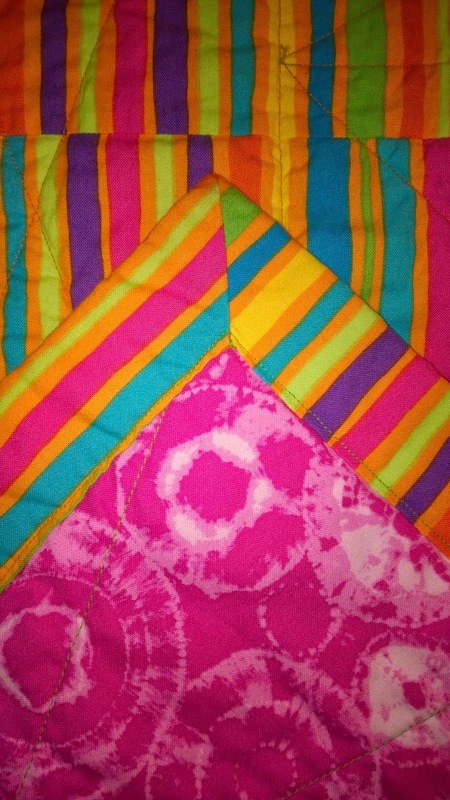 The quilt I just finished was the lap quilt project we taught at camp. It went together so quickly and I whipped it out in no time. I did my first mitered corner on this quilt. 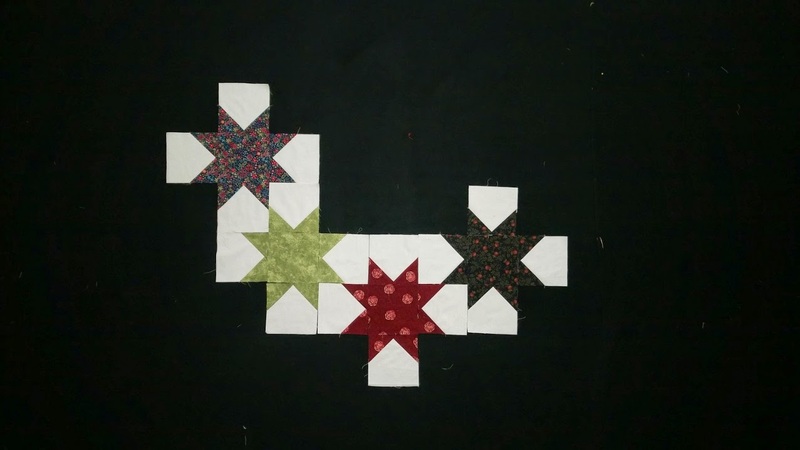 I am slowly but surely getting all the pieces cut out to make the Summer Star Mini Quilt for my sis’ work office. 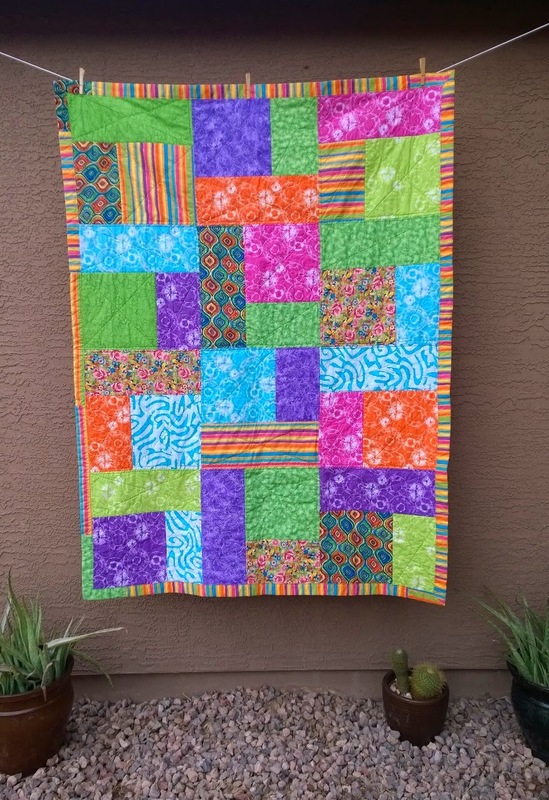 Next on my quilting/sewing agenda is to get the College Bound quilt quilted for my niece. I’ve already got the backing pieced. My goal is to have it basted this weekend. In other news, I bought a 3 mos, Bikram “HOT” Yoga deal on Living Social. I started it this week. The class time that works best for me and the one I prefer is at 530a, Mon, Weds, Fri. If you aren’t familiar w/Bikram Yoga, it’s a 90 min yoga class that is done in a room that is 104 degrees Fahrenheit! I can’t believe I paid for such torture. One week down, 11 more to go! Pray for me!! And for all my Nookers out there in case you don’t already know, Barnes and Noble has Free Fridays on The Nook Blog. They offer a free book, a free app AND a free video every week! A great way to grow your library w/o spending a penny! Hazards in Quilting? Who Knew?! If you would’ve asked me this question a couple of years ago, I would’ve said, “no way”! 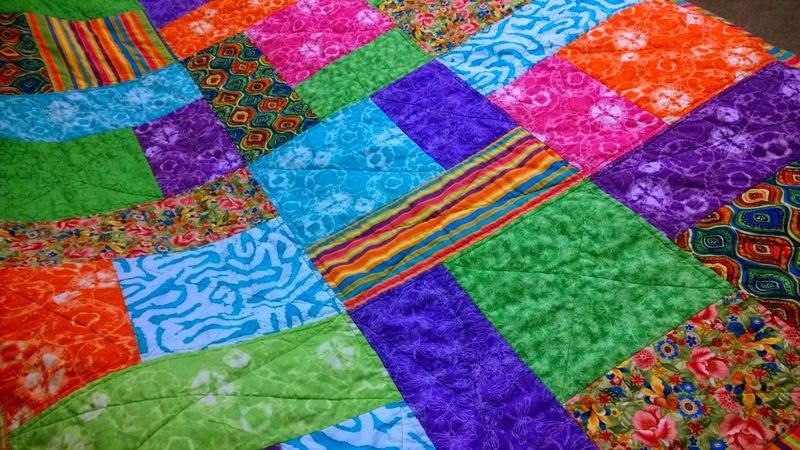 Believe it or not, there are hazards in Quilting and not just to your pocketbook! After doing it for awhile, I’ve found, not only can it make a significant dent in the pocketbook, it definitely takes a toll on ones body. Particularly the neck and back, and personally, my neck. 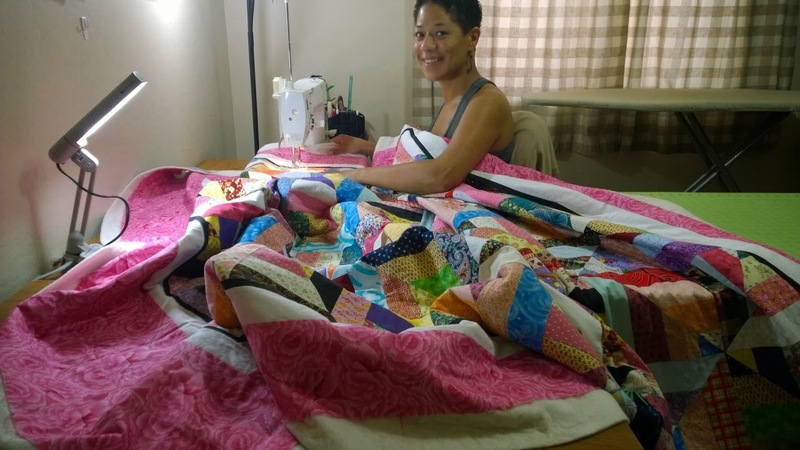 I sew/quilt almost daily and really struggle w/keeping my shoulders relaxed and not straining my neck. After reading a few articles like this, I came to the realization that I’ve been doing it all wrong! 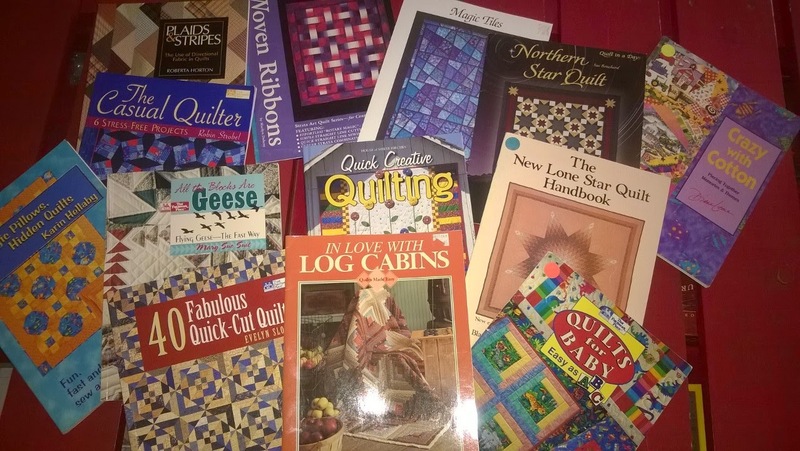 =( I would like to continue to quilt for many, many years to come, so when my neck really started bothering me, I began surfing the web for stretches and/or exercises for sewers/quilters. 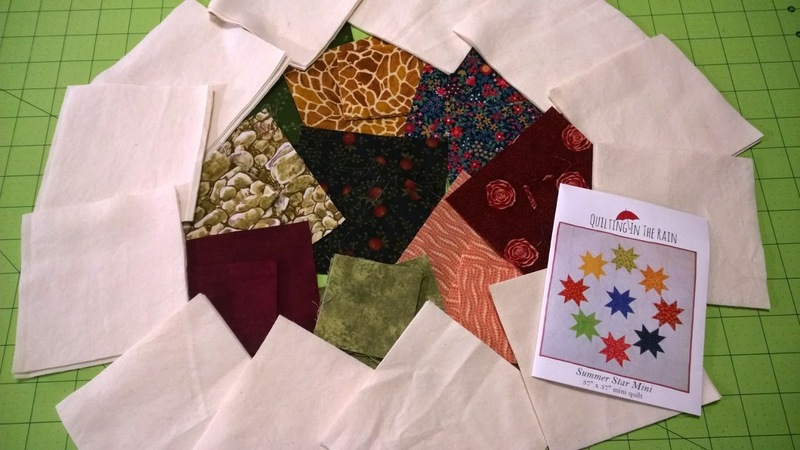 I came across this handy dandy, preventative maintenance pdf: Ten Exercises for Quiltmakers. I pinned it on the wall behind my machine to remind me to take breaks often and stretch. I’m sure the exercises are effective for Readers and heavy Texters too! I’ve since been working on improving my posture, bending from the waist, and using my eyes more than my neck. 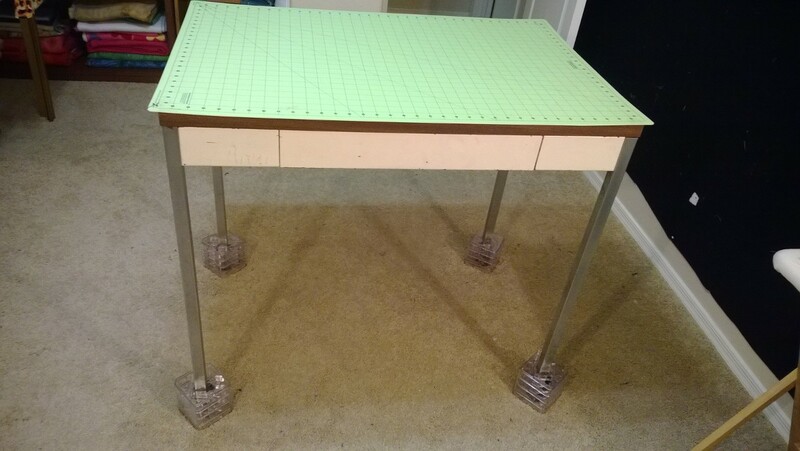 My cutting table is just about the right height. It is raised w/4 – 1″ risers. Another inch would probably do the body better. 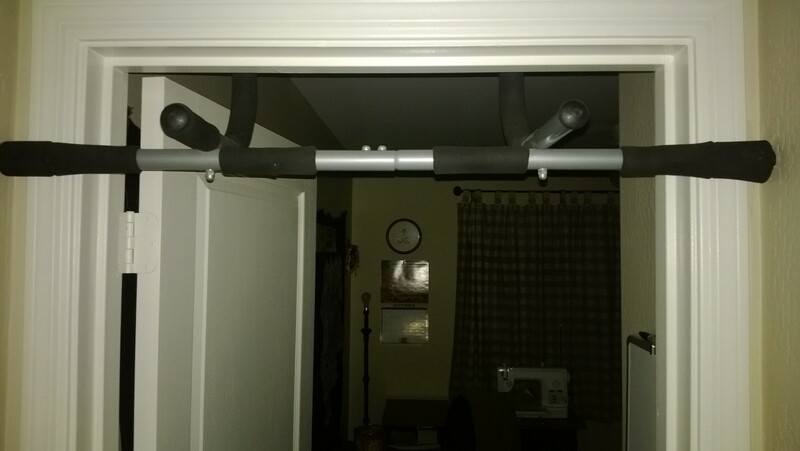 And speaking of exercise, to keep in shape in general AND in preparation for Extreme Flagstaff, a mud run, or hopefully one day Survivor and/or The Amazing Race, my bff Melinda suggested I put my pull up bar in the doorway of my sewing room and do at least 1 pull-up every time I enter. Truth be told, I don’t do a pull-up every time but I do about every 2nd or 3rd time… and I’m up to 2 – 3 reps when I do them! One last thing where exercise is concerned, whether I’m sewing, cutting or ironing, I try to remember to keep my abs engaged (belly button to spine) to tighten my core and strengthen my back. Lastly, from this point forward, I will end each post w/a scripture or verse as encouragement to anyone who reads my blog; a biblical truth or spiritual fruit which is truly my thread for life.